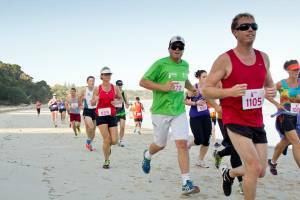 Hundreds Have Signed Up for the Byron Bay Lighthouse Run...Why Not You? You are here:Home » Blog » Festivals & Events » Hundreds Have Signed Up for the Byron Bay Lighthouse Run…Why Not You? The highly anticipated 10km Byron Bay Lighthouse Run on September 28 is one of the most popular and attended events in the Byron Bay calendar. For the majority of us, we’ll have been putting in the hard yards around our streets and parks for months now and are already looking forward to participating and crossing that finishing line at the Byron Bay Lighthouse. Well, not long to go now! We’re hoping you’ve already registered for the Byron Lighthouse Run (or Byron Bay Lighthouse Walk – which is a shorter 6.7km) if planning to take part. If not though, remember that registration closes on September 23. Those who have already signed up but haven’t yet received their registration number should email byronrun@gmail.com. Entry is just $45 ($40 if part of a team of five) and $20 if under 17 years of age. Registration is accepted on the day but the cost of entry at that point is $70 so best to get in ahead of time. Of course you’ll always get those super-fit dudes who’ll fit in the odd 5km as a bit of cross-training but for those of us who aren’t used to running marathons, or even jogging on a regular basis, it’s important to train to prevent injury. Fitness trainer Lisa Parkes, a fan of the Byron Bay event reckons you should already have been doing a bit of hill running seeing as the Lighthouse Run course has rather a few of them! If you have already been doing this, then your running style should be more of a bounce with plenty of high knee lifting movements (which is the best style for the Byron Bay course). If you haven’t done any hill running to date then now is definitely the time to rectify that and get started. The charity event is now in its tenth year and this year’s recipients will be the A7 Oncology Ward at Lismore Base Hospital (who need cash to decorate a room for palliative care) and a Kenyan Hospital run by the World Youth International charity. Have fun, exercise & raise money! Local businesses all chip in with prizes and this year’s main sponsor is Brookfarm which appropriately-enough manufacturer healthy foods using home grown macadamia nuts. The race numbers actually get bigger and better on an annual basis with a total of 900 individuals running last year. There is a competitive element but most of the runners are doing it for fun (there are the odd runners who insist on taking a pram with them – just to make life harder and more fun for everyone else around them). And of course, due to its location, the Byron Lighthouse Run must be one of the most stunning 10km courses in the world. At what other race would you be able to spot dolphins, whales and run amidst tropical greenery on one side and the ocean on the other? Consider staying with us here at Broken Head Holiday Park if you do decide to enter the Byron Bay Lighthouse Run or the Byron Bay Lighthouse Walk. We’re conveniently located for the event and have comfortable beach cabins and beach shacks to relax in after you’ve run (or walked) your heart out. We hope to see you soon!